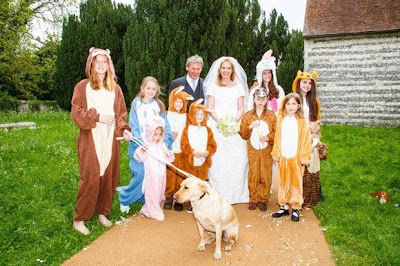 It was a whole year ago that we wrote an article here about an animal costume wedding that we attended (it was great by the way). It seems those guys must have kick-started a trend, because this summer we've supplied at least 3 wedding parties with a bunch of costumes, and last week one even found its way into The Times. The wedding on The Times's radar was that of Kate Reardon, Editor at Tatler magazine. whilst Kate and her groom opted for traditional wedding attire, their bridesmaids were kitted out in various animal onesies and fancy dress animal costumes - check out the picture from The Times above. As far as we know we didn't supply Kate with her animal costumes, but we most definitely applaud and congratulate her choice. If you're having an animal costume wedding or party, let us know! We have the widest range of animal costumes on the planet and offer bulk-buy discounts... and don't forget to send us your pictures people!